A little preparation at home will give you the best meal you've ever cooked on a campfire. Prepare pasta at home according to package directions. Store in a sealable container and place in a zip bag. Place shredded cheeses in a container, flour in its own small bag, and the bread crumbs in their own bag as well. 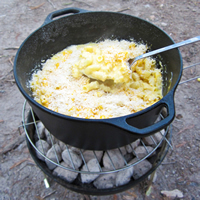 Place macaroni, cheese, butter, and milk in a cooler full of ice to transport to your camping site. Once your camp is set up and you are ready to cook, light charcoals in your grill. When the coals are amber you are ready to cook. Place a large cast iron Dutch oven on your barbecue. Melt butter over charcoals and whisk in milk. One tablespoon at a time, whisk in flour until it has thickened and you have a roux. Salt and pepper to taste. Slowly stir in the cheese blend until it has melted into the roux. Reserve some cheese to top the macaroni. Add cooked macaroni to the dutch oven and stir to coat with sauce. Cover and allow to cook until it is heated throughout, about 5 minutes. Top with reserved cheese and bread crumbs. Cover and cook for an additional 5 minutes. Serve warm.